David C. Knight. Polaroid photograph. Possible hoax. 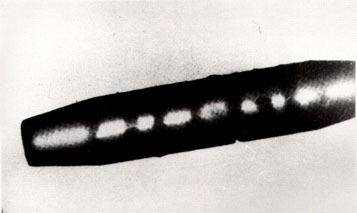 Jagged line of discontinuity running across the center of the photo, through the cloud field, which suggest there are actually two separate photos joined together and rephotographed to make one. - APRO consultant Dr. B Roy Frieden, Professor of Optical Sciences at the University of Arizona. 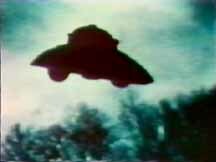 George Adamski carrier craft photo. Photograph taken by Joseph Ferriere. Pho-Tak 620 Reflex camera. Chauncy Uphoff and Mike Hill. The "ball diamond." "They seemed longer than wide. Their thickness was about 1/20 of their width." U.S. Coast Guardsman, Frank Ryman. Note: Similar to the 1952 Barra da Tijuca, Brazil photos. Elizabeth Klarer. Elizabeth shot seven photos before the disc suddenly shot away. August 3, 1965. Santa Ana, California. Rex Heflin. 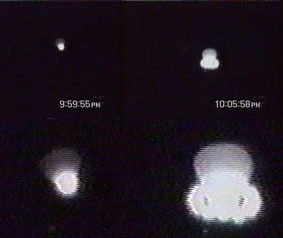 A fourth photograph shows a smoke ring which the UFO allegedly left when it departed.*Controversial. 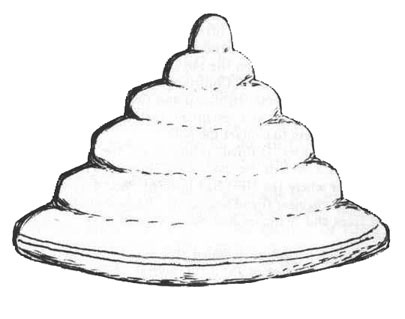 Drawing made by Deputy Strauch to indicate details he visually saw with the binoculars. Arthur Strauch. Strauch used a Kodak Instamatic camera with Ektachrome color-slide film. He had the focus set at infinity, and the shutter speed was set at 1/60th of a second. TV news person, Frank Edwards. A Polaroid photograph, copyrighted in 1979 by David C. Knight has been published on page 138 of the book "UFOS: A Pictorial History from Antiquity to the Present." Mr. and Mrs. Edward Vojtko. January, 1967. Mahwah, New Jersey. March 22, 1967. Youngstown, Ohio. 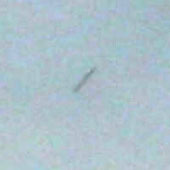 UFO photographed by Tom Downie. June 28, 1967. New Castle, Pennsylvania. 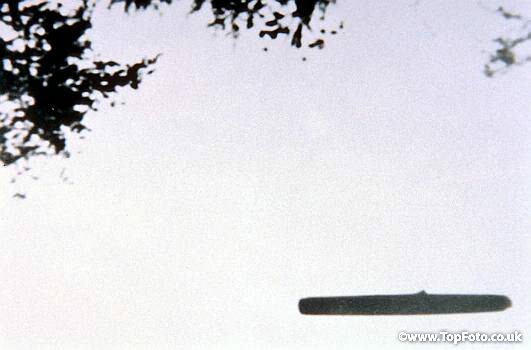 Photo taken in 1968 in Mass. P. Aliranta and E J Sneck. Corsica, France, 1971. 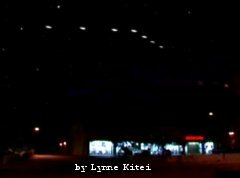 At 4:00pm on February 12, a family who had recently purchased a new home in the northern part of the French island of Corsica, were preparing their camera to take a picture of the new house when one of the party noticed a glint in the sky and looked up. They all looked up to see a shiny, metallic object glinting brilliantly where it caught the sun's rays in the clear blue sky. 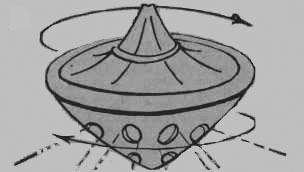 The object was disc-shaped and had a low-profile curved dome on the top, with some kind of oval-shaped or rounded-rectangular black marks or openings around its sides. October 16 or 17, 1973. Blyton, Indiana. Masato Kawano (7 years old) and Katsuhiro Yamahata (7 years old). Jane Baker, Philip N. Baker family. Hirohito Tanaka. Instamatic 126 camera. 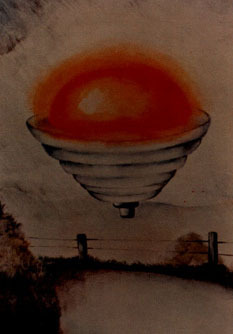 Alfred Burtoo's sketch of the craft. Fall 1990. Almont, MI, north of Detroit. Artist Joe Clower (possibly fake). February 16, 1994. Ocotlán, Jalisco, Mexico. 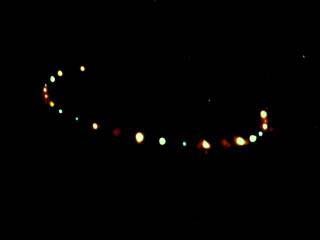 Photo taken on 23 January 1997, in the Nevada desert, by Christopher. Cem Arat and Mehmet Safak. May 21, 2002 Guadalajara, Jalisco Mexico. Illija. Mustek GSmart Mini 3 camera. 3.5 mega pixel digital camera. 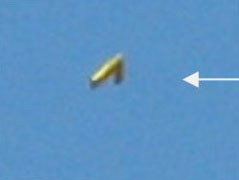 Mike Lindstrom took three photographs of a UFO - it was square when seen from below. 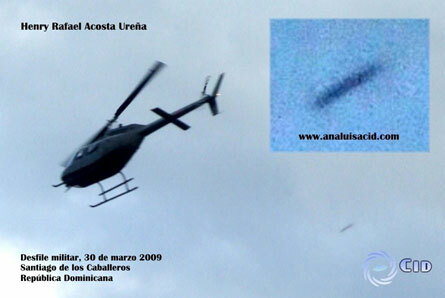 UFO photographed by Gabriel Kozora. F-16. 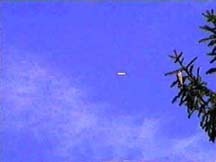 This clip displays an object/target acquired through the Pilot's Heads up display Unit or H.U.D.